Why, yes, I will be riding this Quatermass gravy train as long as I keep doing these A-Z challenges. Last year we re-watched The Quatermass Xperiment, a superb thriller that was the prototype for a particular sub-genre of monster movies. And this year I find myself re-watching its sequel, once more adapted from a Nigel Kneale TV serial, and finding it both more and less than its progenitor. 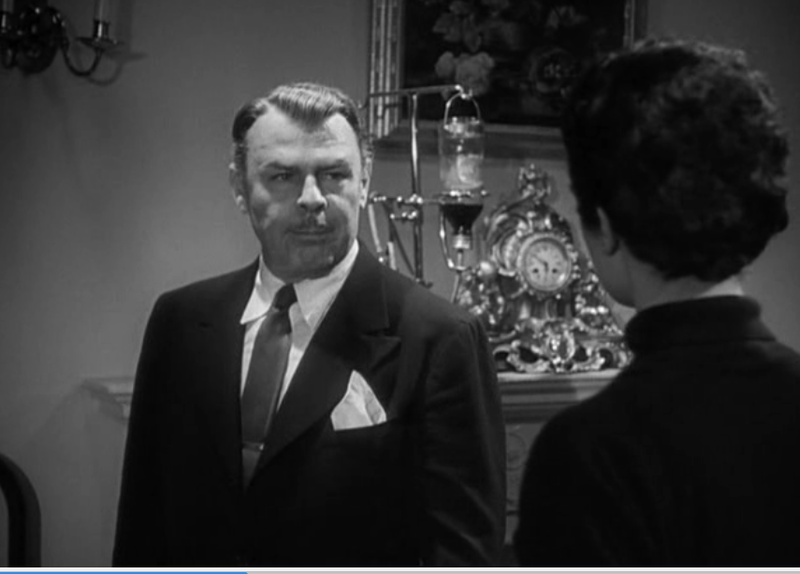 Quatermass (Brian Donlevy), the American head of the British Rocket Group, has problems, and oddly, they aren’t because his last launch brought a monster back from outer space. His current model rocket has a nuclear engine, and it is so faulty that it can’t be safely launched, putting his whole Moon Base project in peril. Adding to this bad day is the near-accident that opens the movie, as a woman trying to get her injured and seemingly delirious boyfriend to a hospital, nearly runs him off the road. This boyfriend was burned by an apparent meteorite that broke open in his hands. Speaking of meteorites, the radar at the Group’s rocket base has been picking up strange swarms of small objects, except they’re moving too slowly to actually be meteorites – and they’re all falling at the same remote village where the man was injured. Quatermass takes a road trip there, ignoring various KEEP OUT signs, only to find a ruined village and… his Moon Base. Much skullduggery and digging up details follows, as Quatermass eventually determines this facility – supposedly a top secret project developing “artificial food” – actually is a Moon Base of sorts – the pressure domes housing not astronauts, but the creatures traveling in the fake meteorites, which cannot exist in Earth’s atmosphere unless they invade and infect human beings. It’s a quiet invasion that’s been going on for several years, compromising even the higher reaches of government, and it’s up to Quatermass – and our old pal from the first movie, Inspector Lomax of Scotland Yard (John Longden, this time) to put a stop to it. So the breadth of the story this time does not have the same lean, mean quality of Xperiment, and that is perfectly all right – that is what a sequel is supposed to be, and so rarely is – an expansion on the first movie, with new challenges for its heroes. The back-and-forth nature of the plot’s unfolding works against, it, though, and it’s going to take Quatermass three trips into the danger zone to find out what is going on. That’s likely more due to the compression of the original serial, which ran to six half-hour episodes, than any actual fault with the filmmakers. Nigel Kneale and director Val Guest share screenwriting credit here; Kneale had renegotiated his contract to have more power, but he couldn’t override Donlevy’s return as the title character. Kneale hated Donlevy’s brusque, barking version of Quatermass, and claimed his alcoholism ruined everything (Guest vigorously denied this). Guest trimmed down Kneale’s philosophizing and tried, once more, to produce a movie as close to cinema verite as possible, rendering the fantastic real. There is at least one cast member carried over from the TV version: the Shell refinery at Stanford-le-Hope, Essex, doubling for the ersatz moon base, a tremendous amount of production value, right there, providing the sort of sets that the fledgling Hammer Films would not have been able to afford. Oh, yes, it’s a Hammer Film. The Quatermass Xperiment was such a financial success for them, they had optioned Quatermass II (note the fancier Roman numeral) before the first page of script had passed through a typewriter. 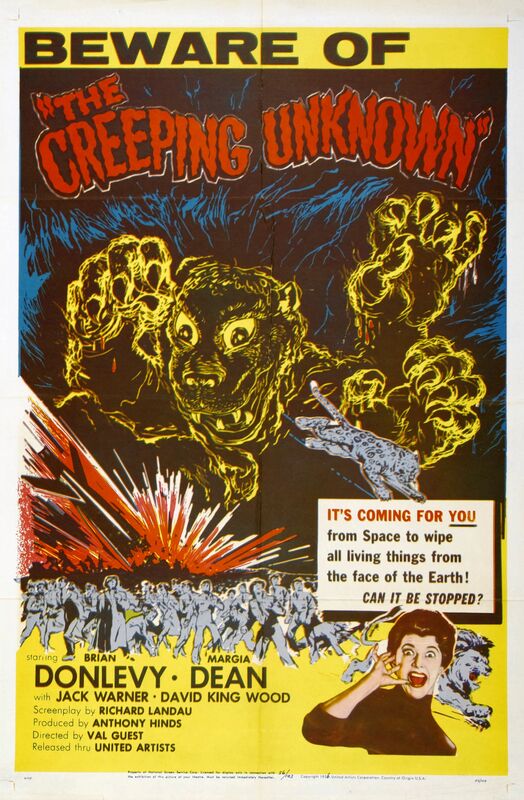 Hammer had, in fact, tried to make another Quatermass movie in the meantime, only to be stymied by Kneale’s refusal to license his character; the result was 1956’s X the Unknown, which is actually a pretty effective horror movie, even if it is faux Quatermass. Their anxiety over continuing this fruitful line of production would be forgotten later in 1957 when they released another little movie, Curse of Frankenstein. Quatermass 2 is generally regarded as the least of the Quatermass movies, but look what it’s up against! Xperiment and Quatermass and the Pit are both superior horror/science-fiction, and dismissing the middle child here is doing it a disservice. It is a darned good tale, and if you want to dig a little deeper, you can even say it is an allegory for corruption in high places, or government being suborned by corporations. It shouldn’t be passed over, because it is, at the end of the day, good entertainment, even if it does feel langorous in pace and yet, somehow at the same time, somewhat rushed. 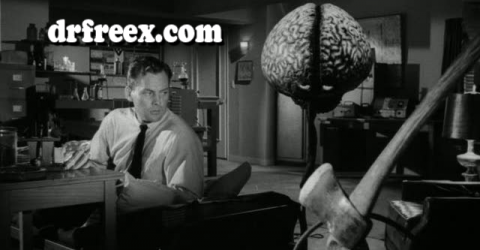 Of course we yanks wouldn’t go to some movie with a sissy name like Quatermass! We need a more manly title! You can try to buy Quatermass 2 on Amazon – good luck! We’ll get a commonly-known piece of trivia out of the way: the missing initial “E” in “Xperiment” was a clever little nod to the British film classification’s “X” rating – no one under 16 allowed. That wouldn’t have flown for us Yanks, though, who needed none of those fancy-pants classifications, we just relied on good ol’ censorship to make our movie-going safe. So over here we called it The Creeping Unknown, which is much more butch. 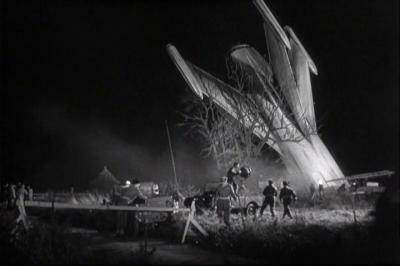 So a rocketship crash lands just outside a British farmhouse, and among the folks flocking to the crash site are Professor Bernard Quatermass (Brian Donlevy) and Dr. Gordon Briscoe (David King-Wood) of the British-American Rocket Group. Quatermass, ever the pushy American, sent out the rocket and its three-man crew without waiting for official sanction, much to the dismay of the man from the Home Office (the always welcome Lionel Jeffries). And now this! Jeffries sputters. Shut up, Quatermass explains. It turns out only one crewman is in there – Victor Carroon (Richard Wordsworth). All that remains of the other two are empty pressure suits. Caroon is in shock and can say nothing. 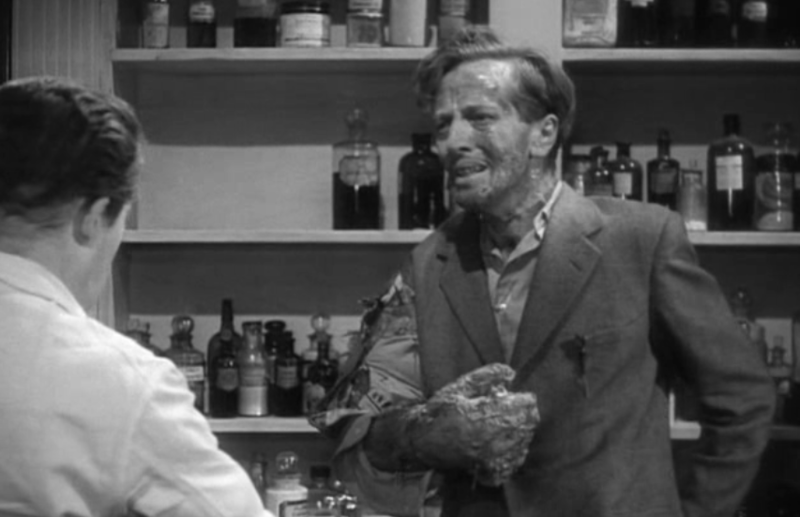 Eventually Carroon deteriorates to the point that Briscoe overrules Quatermass and has him taken to a hospital – where Judith, having had enough, hires a detective to smuggle her husband out. During this escape attempt, Carroon can’t hold out anymore and punches a decorative cactus in his room. The investigator notices that Carroon’s hand is now changing into cactus, and Carroon kills him, “absorbing his essence” -ie., sucking all the blood and water out of his body – and escaping into the night. 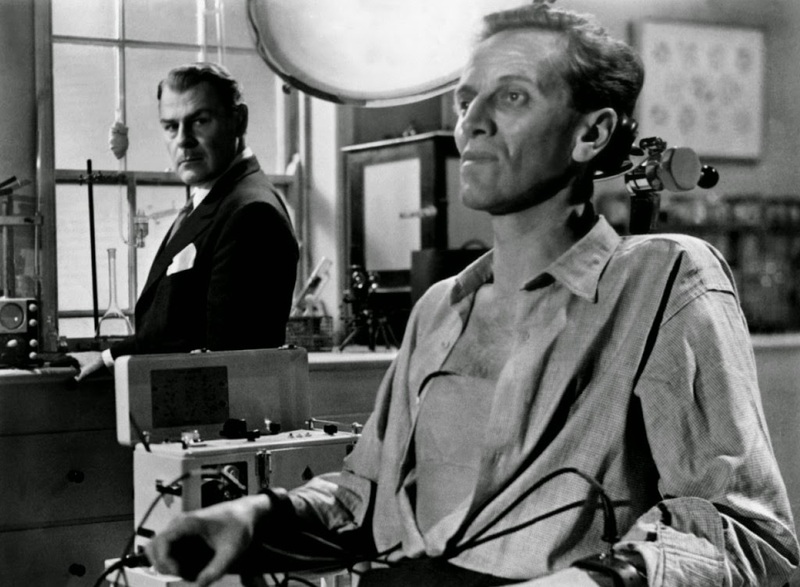 Quatermass, reluctantly joining forces with Inspector Lomax of the London Police (Jack Warner), now must track down the metamorphosing Carroon as he lurches about London, trying not to kill people but failing as the alien thing inside him grows and grows. A piece – or something of a seed pod – falls off, and examining it while it eats mice (offscreen, luckily), Briscoe deduces that once Carroon fully transforms, he will release spores, and then there will be millions of the creatures. This is, of course, the first of the highly successful Quatermass movies, based on a character created for a popular BBC TV serial, which was, for 1955, “Event TV”. It was written by Nigel Kneale, a name which would become synonymous with intelligent science fiction. Many film companies were interested in turning it into a movie, but they all balked at making something that would surely be rated “X”. Except for this one upstart company, known up to that point for only making “second features” – what we call “B movies” over here. A little studio called Hammer Films. 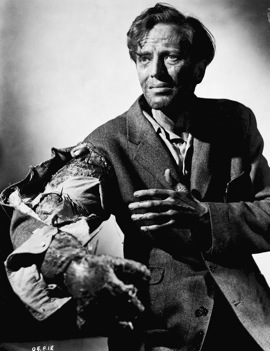 Director Val Guest, heretofore known primarily for comedies, claims that he was the only person in England who didn’t watch “The Quatermass Experiment” when it was first broadcast – he didn’t like science fiction. He intended to put off Producer Anthony Hinds by going on vacation and only grudgingly taking the script with him. His wife, actress Yolande Donlan, teased him about it until he read the script in one afternoon on the beach and fell in love with it. Kneale’s original serial ran three hours, I believe, and was heavily edited for the movie. What he resented even more, however, was the casting of Donlevy as Quatermass, a necessity for selling the picture to an American market. In the serial, Quatermass is a thoughtful Oxford Don type. It has to be admitted that Donlevy’s brusque, no-nonsense approach to the character propels the movie forward like a barking dog shepherding its flock. Kneale had his contract with the BBC re-negotiated so he would have more control over his intellectual property in the future (though Donlevy is still playing Quatermass in the sequel film Quatermass II – in America, Enemy From Space). 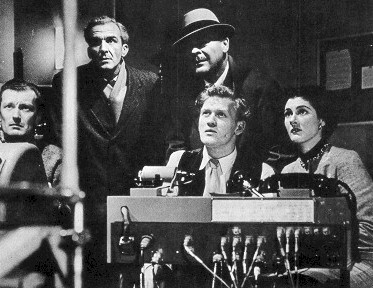 Val Guest’s equally no-nonsense direction is what gives Quatermass most of its power – he decided that such a fantastic story – this is still two years before Sputnik, remember – needed a realistic delivery, and tried, as much as possible, to shoot the movie in a documentary fashion, to great effect. And no discussion of Xperiment can be complete without at least a mention of Richard Wordsworth’s performance as the doomed, tortured Carroon. Never speaking, everything the character is experiencing – the horror, the struggle – is delivered only through facial expression and body language. Best known as a theatrical actor with occasional TV roles, this is Wordsworth’s first movie role. Certainly not his last. This is a ground zero movie, folks. This is the progenitor of its own sub-genre; from this descends First Man Into Space, Monster-A-Go-Go and others. As the first, it demands some respect, and that respect is quite honestly deserved. And now for a spoiler-iffic trailer!